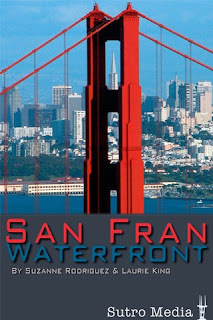 Today and tomorrow you can download my top-rated travel app, San Francisco Waterfront, along with 9 other top-rated apps covering the San Francisco Bay Area. For free! Why? Most of us app authors have known each other a long time through various travel writer organizations, and we've decided to collaborate on this giveaway. Many thanks to Karen Misuraca, author of many print guidebooks and the wonderful travel app, California Coast North, for spearheading this project. To download the apps, go to this page on Karen's site.You'll see all the apps listed and you can choose which ones to download. Ignore the prices you see: when you get to the iTunes store, the apps will be shown to be free. Download the apps and then come visit and leave your heart in San Francisco! Maybe lard's not so bad after all...?